Hey everyone! I have my color opposite mani for you today! 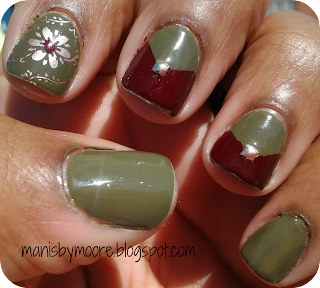 I had two ideas for this mani and did not want to use either one. It was blue and orange or purple and yellow. I did not want to do the same old same old color opposite mani. I wanted to try something different. 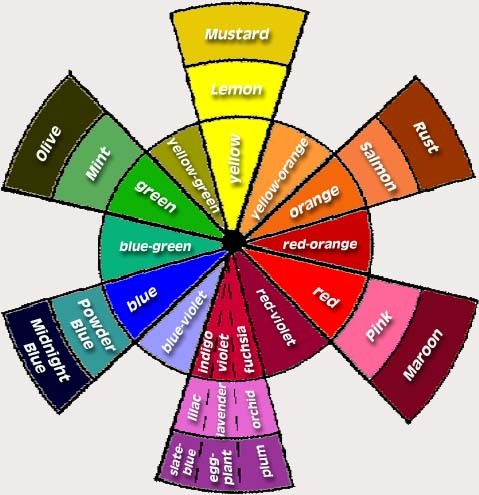 I googled and found the color chart below. I plan to refer to this to create more mani's! I love so many of the color combos that can be created! I decided on the olive and maroon. 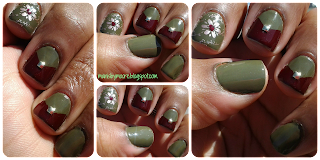 I have been itching to wear some olive polish and this seemed like the perfect time to use it. I also used something new for me. I have had these gold studs forever and decided to used them today. I think this mani turned out great! What do you think?? I would have never did this color combo without this challenge! I am definitely enjoying this challenge! Now that the dreaded water color prompt is over. I am still cringing over that. I think I redeemed myself with this mani! You need to paste it in your blog post while your blog is in HTML mode. We will post anytime after 8:00 am by my time zone. I am in the United States in Oklahoma (Some of you are from India! Welcome!). I will post the code for each week with my Tuesday post. If you would like to have all of the codes in advance email me at manisbymoore@yahoo.com and I will email you all the codes for the upcoming weeks. What are your favorite color opposites?? Will you be joining us in the Girly Girl Challenge?? Thank you so much!! That plate is new to me and I love it sooo much! Thank you so much! I definately will be refering back to it. Thank you so much!! I will make sure to do the questions. More than likely I will not be able to do it until tomorrow. Again thank you so much! !